Make a word. Hint: it’s job. Riddle: What occurs once in a minute, twice in a moment and never in a thousand years? Make a word. Hint: it’s food. Riddle: What has two hands and a face, but no arms and legs? Riddle: The more you have of it, the less you see. What is it? l o e u r s d h. Hint: Body parts. Connects the to arm and to the base of the neck. Riddle: What is found over your head but under your hat? u o o s i t p p p a h m . Hint: it is a large animals. Clean, but not water, White, but not snow, Sweet, but not ice-cream, What is it? 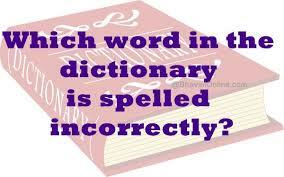 Riddle: What is the word that is spelled incorrectly in all dictionaries?